If you plan to use eBay for multiple sales, you may consider using Turbo Lister to make your life significantly easier. To use Turbo Lister, you must first download it. After you install Turbo Lister on your computer, you can list your sales on the easy-to-use form. What could be more convenient? The requirements for using Turbo Lister appear at the bottom of the page. Click the Save File link. Clicking Save file downloads Turbo Lister. Double-click to open the file once it downloads. The Windows Security warning appears, cautioning that you’re about to download something foreign to your computer. Click Yes; clicking No doesn’t open the file. Just trust eBay and click Yes. From this point on, installation is automatic. Voilà! Turbo Lister is on your computer. Note that this procedure first downloads a small setup version of the program that checks your computer for preinstalled files. When that task is finished, Turbo Lister checks back with mothership eBay and automatically downloads any files it needs. After you’ve installed the program, you’ll see a new icon on your desktop; a little green man juggling magic pixie dust over his head. This is the icon for Turbo Lister. Double-click it and you’ll see the Turbo Lister splash screen with eBay’s tips of the day. This screen pops up every time you open the program. You may find it annoying and that it wastes precious seconds of your time. To avoid seeing the tips, select the check box labeled Do not show me this screen again, and then click Start Here. The splash screen will be forever banished. Select the Start option from the opening screen, and click Next. Fill in your eBay user ID and password, and then click Next. 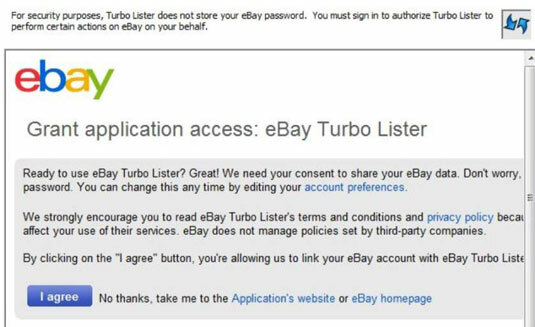 Turbo Lister now wants to connect back to eBay to retrieve your eBay account information. Make sure your Internet connection is live and then click the Connect Now button. In a minute or so, a small window opens, asking you to give eBay permission to access your eBay data. The program fires up and is ready to list.